MySQL is one of the most used database for web based application. It’s the M in LAMP stack. Ubuntu 16.04 Xenial Xerus shipped with MySQL 5.7 so we can easily install MySQL 5.7 without adding additional repository. In this tutorial we’ll learn how to install MySQL 5.7 on Ubuntu 16.04 LTS (Xenial Xerus). 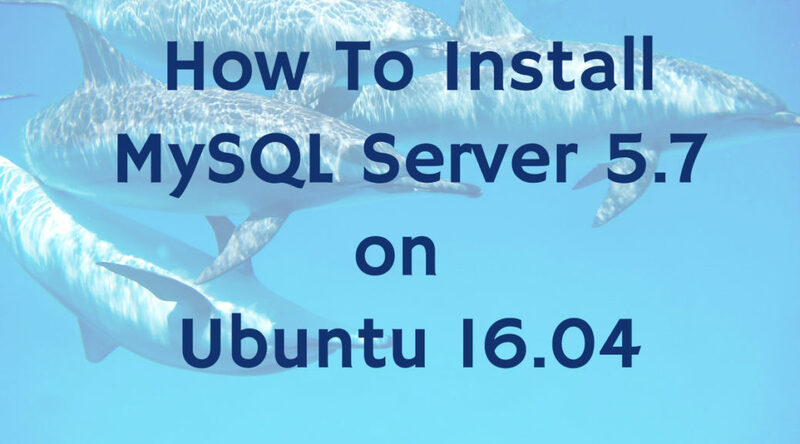 This tutorial assume that we will install MySQL 5.7 on a fresh Ubuntu 16.04 installation or on a system that have no MySQL server or similar database like MariaDB or percona server for MySQL installed. Press Y to continue the installation process. The installation process will take some times to finish since it needs to download mysql-server and all dependencies from internet. The installer will ask for MySQL root user password. Please not that MySQL root and Linux system root is different. After the installation is finished you can check the service status using command below. The output should look similar to output below. The output below shows that MySQL is running. Jul 17 19:33:34 ubuntu-xenial systemd: Started MySQL Community Server. To stop MySQL Server you can use command below. When we re-check the status it will show that the server is stopped. Jul 17 19:35:48 ubuntu-xenial systemd: Started MySQL Community Server. Jul 17 19:35:56 ubuntu-xenial systemd: Stopped MySQL Community Server. Now let’s login to MySQL Server that we just installed. Enter root user password that we set on installation process. After successful login we will get to MySQL console. Press CTRL+D to exit from MySQL console. We can secure MySQL server 5.7 with tools shipped with MySQL called mysql_secure_installation. We don’t need to do sudo to run this application. Let’s start securing our MySQL installation. First step is to enable Validate password plugin. We will enable this plugin by entering Y. The script will check for current root password strength. My current root password strenght is 50, I choose to change the root password that I use. Input new password and confirm new password. Remove anonymous user by choosing Y. Ensure root can only login locally from the database machine, this will block root login remotely. We finished securing our MySQL database installation. MySQL provides several <a href=”https://dev.mysql.com/doc/index-other.html”>sample database</a>. We will use Sakila sample database to be imported to our mysql database installation. Input sakila schema. This will create database and tables. After successfully login lets see list of databases. Show all tables inside sakila database. In this tutorial we learned how to install MySQL 5.7 on Ubuntu 16.04. We learned securing MySQL installation using mysql_secure_installation script provided by MySQL. We also learned importing Sakila sample database and do several queries to the database. Have fun with MySQL!